Towards clean villages with healthy and happy families! Today, more and more people and groups are determined to overcome the challenges like heavy pollution, unequal markets and natural threats and diseases that stand in the way. They are supported by members of the diaspora in the Netherlands who are slowly moving away from top-down interventions to acting alongside their brothers and sisters on the islands. In February 2015 a first group of 20 facilitators was trained in the SALT approach to help ensure ownership of solutions and actions. 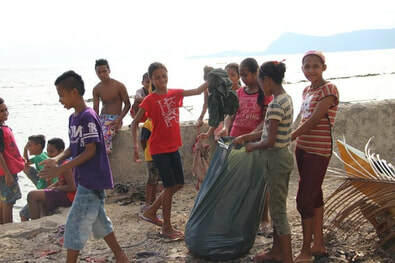 At the end of the year community owned responses were happening on the islands of Ambon, Saparua and Ceram. In the Constellation, local teams and country teams grow as Starfishes: all the cells of the organisation share the same vision and values. The teams fulfill the same functions of Transfer, Learn and Share whether they are local, national or global. Now, there are fertile grounds in Maluku to set up a Local Facilitation Team (Maluku Competence, as a starfish of the Constellation) that solidly brings together the people in Maluku who are motivated to be the change on their islands. This Local Facilitation Team would stimulate and support communities in taking actions towards their dream, using the SALT approach. They would facilitate the transfer from good practices from one community to a next. They would share lessons learned also outside the Moluccas. The Local Facilitation team would welcome support and accompaniment by experienced international Constellation coaches. They would need a modest budget for the setup of learning gardens, fee and local transport costs to support the communities on their way towards life competence. Make your donation to the Constellation with mention of MOLUCCAS 2017. ​The Constellation works on invitation and we aim to respond to every request for accompaniment. Our Blended Learning Modules allow us to train SALT facilitators in communities if funding for face to face accompaniment is lacking. - Your 300 EUR contribution supports in depth e-training for one facilitator. - Your 900 EUR contribution helps a Triad to learn together from their SALT application, guided by an experienced coach. If you so wish, we will bring you in touch with the facilitator(s) you sponsored so that you may learn from them! Make your donation to the Constellation with mention of FACILITATOR 2017. The Constellation supports the Sankuru SALT teams fundraising activities by shedding a light on their activities. From 15 October 2016 – 15 January 2017 you will read regular updates on progress in Sankuru on Constellations virtual platform and in our newsletter. Your financial contribution is important and highly valued. The Moluccas have their own support team! Want to find out more about Maluku Competence? How to become a member, share your story, contribute time or money, and help us share about local responses by spreading the word.